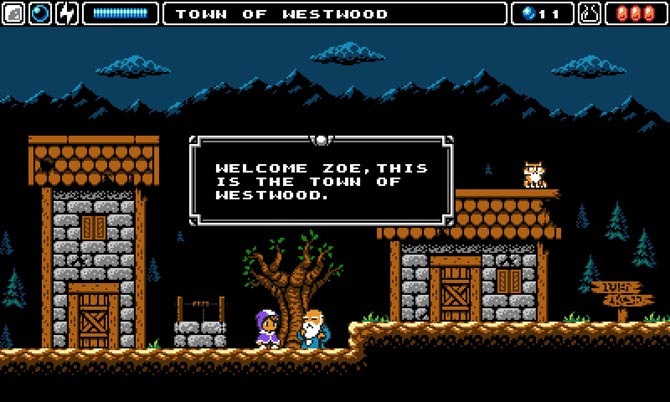 In Alwa's Awakening you play as Zoe, a heroine sent from another world to bring peace to the land of Alwa. Equipped only with a magic staff she awakens in a distant land and must set out to help the people. Traverse dangerous dungeons, meet interesting and fun characters and explore the world in this 8-bit adventure game. Just like the old classics you won't have a flashing arrow telling you exactly where to go and what to do next. Instead you are free to find your own way and by using your magic staff you can progress through the over 400 unique challenging rooms in the game.lwa’s Awakening is a game that tries to stay as close as possible to the authentic 8-bit look with sweet pixel art, a soundtrack filled with catchy chiptunes and so much charm it’ll bring you right back to the NES era. With easy to understand controls the game is easy to learn but tough to master, just like how games were in the old days!